Red Rocks Community College is a proud member of the Arvada Chamber of Commerce. 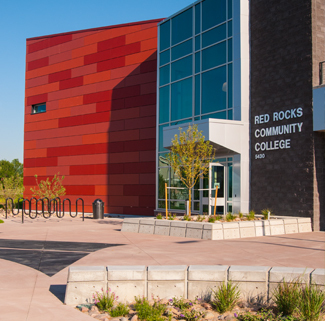 The Red Rocks Community College Arvada campus is home to RRCC’s Health Sciences programs, as well as an associate degree and general education courses that transfer to four-year institutions. Students pursuing RRCC Health Sciences programs will learn from instructors who are practitioners in their respective healthcare fields and are trained to provide instruction that focuses on cultural competency, care for the aging patient, and mental health awareness. Whether you are interested in one of the Health Science programs, looking to earn an associate degree or looking to take a general education core course for transfer, our Health Sciences programs at the Arvada Campus is the place for you! The campus offers a one-stop-shop student support resource desk offering Admissions, Advising, Financial Aid and much more. The Arvada Fitness Center is located in the 5400 Building just south of the main campus building. See this map for reference. or contact the Welcome Desk. All fee-paying students automatically have access to the Fitness Center (as well as the Recreation Center in Lakewood). Non-fee-paying students and Faculty/Staff may opt into the SRC fee at the Cashiers Office in Lakewood. Need transportation to our campus? If you are planning to take a class (traditional or online) at this campus, you go through the same process as signing up for classes at our main campus. Visit our Admissions page to view the registration process.